A big thanks to Stephen Hotchkiss from The New New Age for stopping in this weekend for an impromptu tea demonstration. If you’ve been in our store recently, you’ve probably noticed their tea on our shelves. White packaging. Bold illustrations. Distinct recipes. 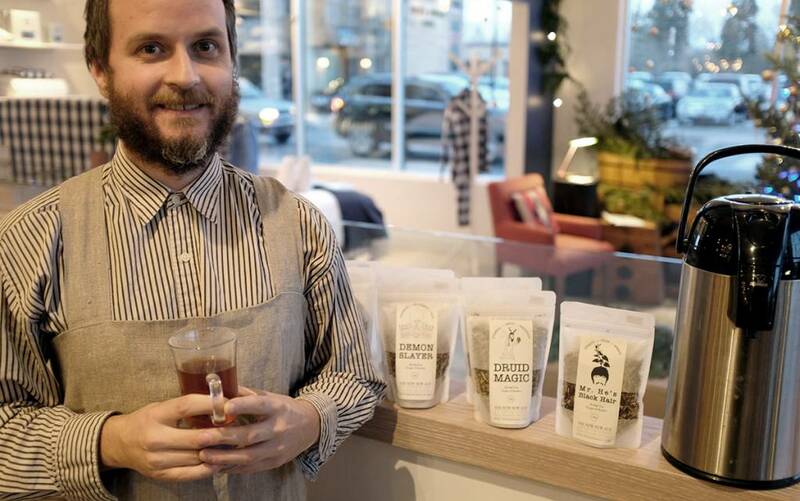 Stephen is an herbalist based in southern Ontario and he and his wife Katie have created their own special blends of Organic and Wildcrafted herbal teas that you just have to try. Visitors and passersby were treated with delicious samples of hot tea, demonstrations and instructions, and stories from their newly founded boutique/café in Port Stanley, ON and from their nearby farm. Obviously, if you’re ever traveling Ontario, The New New Age is a must see. Their shop is set on a picturesque street in a charming beach town on Lake Erie, surrounded by galleries and boutiques. They’ve only been open a few weeks, and have already caught the attention of Ontario foodies and local celebrities, such as fashion icon Jeanne Beker and chef Michael Smith. They serve farm-to-table selections from the surrounding area, their own elixirs, teas and fresh pressed juice, house made chocolate, and, of course, vegetables, herbs, nuts, honey and berries from their own farm. And if you can talk them into a tour of the farm… it’s an absolutely spectacular walk through fields, farm-scale permaculture, and native Carolinian forest. If you missed this weekend’s demo, and if you can’t make it to Ontario anytime soon, the next best thing is to grab some of their unique tea blends from us here at Goldgrass Home!